This is a brand new Wedding Flower Girl Basket great for your special day! This white flower girl basket is beautifully woven in a diamond pattern with quality smooth Satin accented with faux pearls at each intersection. 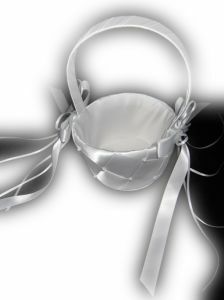 On each side of the basket at the base of the handle, there are wide satin ribbons and thinner satin ribbons that has a center that is decorated with a floral design made of eight faux pearls. The handle is encase with white satin. The basket opening measures 4-1/2" wide, 3-1/2" deep, and the handle is 6" tall. Total height is approximately 9-1/2".